Clutter, now that school is underway, has had a chance to take hold and start growing at a rapid rate. 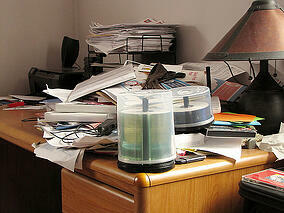 I’ve been a diligent clutter buster for years. In fact, my husband once bought me a magnet that reads “Organized People Are Too Lazy to Look for Things”, in a playfully teasing nod to my tidy ways. (Maybe you can guess why I need to continue my diligence on the home front.) Whether at home or with clients, when it comes to school work and related items I have discovered 4 easy steps for minimizing clutter and getting organized. Scanning papers to help get organized is also a great skill to model for teens. We often assume that because they are computer natives that they know what to do. I have often found that students who are disorganized with their belongings may also be disorganized with their desktop filing system. By modeling the use of folders, keeping an electronic calendar and knowing what to do with papers that need to be saved, we are helping our kids to create systems as well. When kids walk in the door, the tendency is to drop everything. First, as Sarah Ward recommends, create a “drop zone”, which is the place where the backpacks always go. I recommend an assigned coat hook and bin for each child. I found some attractive baskets and labeled one for each child. Not only do they know where to put their things when they get home, they know where to find them the next day and when company comes, the baskets can be stored out of sight. For students with Executive Function issues, it can be difficult to visualize what goes in the basket, or what the backpack will look like when it is ready. If your child needs a visual cue, take a picture of the items that should go in the basket, laminate it and tie it on. The same can be done with the backpack or sports equipment bag. It can be more effective to use a picture rather than a checklist. I recently asked a group of teens where they do their homework. While most kids are working at some type of table or desk, I was surprised by the number of teens that answered that they like to do their homework in bed! No matter where your child is doing homework (and we really recommend against doing school work in bed), there should be a place for general supplies such as paper (graph and lined), pens and pencils, stapler, memory sticks etc. I have used a portable file box exactly for this purpose. One of my students prefers to do her work at the dining room table. She keeps all of her textbooks and supplies in the portable file box which can be easily moved to other locations. At the end of the night, after packing her backpack, she puts all the books that can stay at home in the file box. If your child does not use a dedicated homework space, then it’s a good idea to use a strategy like this to help them efficiently locate supplies before they start working. For the disorganized child, the backpack can become a black hole where everything disappears. With most of the students that I coach, organizing materials is a part of each session. One of my students reaches for his backpack and starts organizing all of the loose papers as soon as he sees me coming. Create a weekly time to go through the backpack with your child. Before you get started, have a 3 ring hole puncher, a trash bag and a recycling bag close by. Purchase a plastic file box for papers that no longer need to live in the binders. Keep in mind the FAT rule - File Action Toss. Ask your child is this a File, Action or Toss? If it is File, does it belong in the binder or in the appropriate file in their file box? If it is an Action item, what is the action that needs to be done? Write it on a sticky note and note it on a calendar or planner to make sure it gets done. If it is a Toss, make sure you really don’t need it and throw it away or recycle it. While it is the rare teen that would enjoy spending their time organizing with a parent, you can use a timer (let’s just do this for 5 minutes) or a fancy latte as incentive (let’s just do this for 5 minutes and we can go to the coffee shop) or better yet, choose your favorite café and spend a half hour cleaning out the notebooks! Follow these 4 steps to minimizing clutter and getting organized, and you’ll be amazed at how quickly you’ll find important items and papers when you need them. In other words, crush the clutter and gain peace of mind. Does your child need help getting organized or developing other self-management skills? Click below to find out how Executive Function coaching can help.